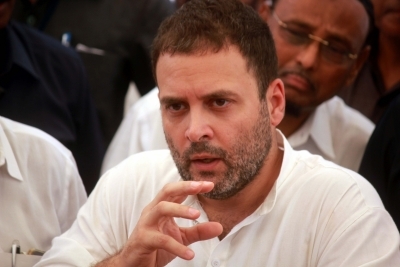 New Delhi, Oct 24 (IANS) A day after describing the Goods and Services Tax (GST) as “Gabbar Singh Tax”, Congress Vice President Rahul Gandhi on Tuesday again hit out at Prime Minister Narendra Modi over the pan-India tax regime, saying it was designed so as to grab peoples’ earnings. “Congress GST = Genuine Simple Tax. Modiji’s GST = Gabbar Singh Tax = Ye kamai mujhe de do (Give me these earnings),” Gandhi mocked in a tweet. Gandhi’s remarks highlighted the difference of the GST proposed by the previous Congress-led UPA regime and the one implemented by the Bharatiya Janata Party (BJP) government. “Ye jo inka GST hai, ye aam aadmi pe bojh hai… Ye GST nahi, ye Gabbar Singh Tax hai,” Gandhi said.